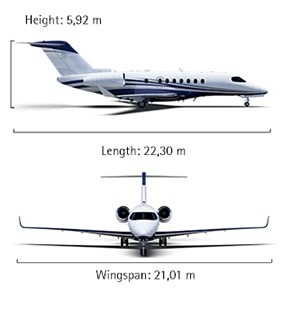 This is the Citation Longitude, the aircraft that won over the market by revolutionizing the mid-sized jet category with improved performance, above average comfort, and state-of-the-art technology. Take command of the Citation Longitude and have in your hands the powerful Honeywell HTF7700L turbofan engines, equipped with FADEC and fully integrated autothrottles. Through its own mobile devices, the Citation Longitude allows passengers to control the cabin's entire climate and entertainment system, as well as to have access to an exclusive Internet system, increasing productivity even during flights. All this with the most advanced flight platform, the Garmin G5000, which reduces the pilot's workload and raises the safety level to a new standard. The engaging design of the Citation Longitude features lines and curves that will surely win you over. With a large cabin, totally flat floor, and standard double-club configuration, the Citation Longitude offers the most legroom in the category, comfortably accommodating up to 12 passengers. And there is more: the aircraft also has a luggage compartment fully accessible from inside the cabin so you have access to what you need whenever you want.